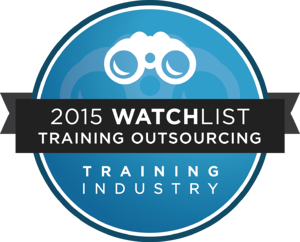 TrainingFolks Named to the 2015 Training Outsourcing Watch List! "This year's Training Outsourcing Watch List demonstrates the continued growth of this segment and the emerging competition," said Ken Taylor, President,Training Industry, Inc. "The organizations on the Watch List are making great strides to provide quality and innovative services for their strong list of clientele." "Business Process Outsourcing is a key part of the training industry and this year's Watch List exhibits the necessary strength and capability of companies to compete in that segment," said Doug Harward, Chief Executive Officer, Training Industry, Inc. "These companies are able to deliver superior learning service solutions that meet the content, administrative and technological needs of a constantly evolving market. “My team and I are honored to have made it to the 2015 Training Outsourcing Watch List” says Matthew Davis, CEO of TrainingFolks. “This accomplishment is in direct correlation to our continued desire to develop and deliver the latest in training services and technologies to Fortune 1000 companies on a global basis. We are very proud of what we have accomplished over the past 20 years." Implementing a new technology across your organization? Download our Technology User Adoption Checklist today!